The most complicated cigar in the Alec Bradley portfolio is now on its way to cigar shops across the United States. 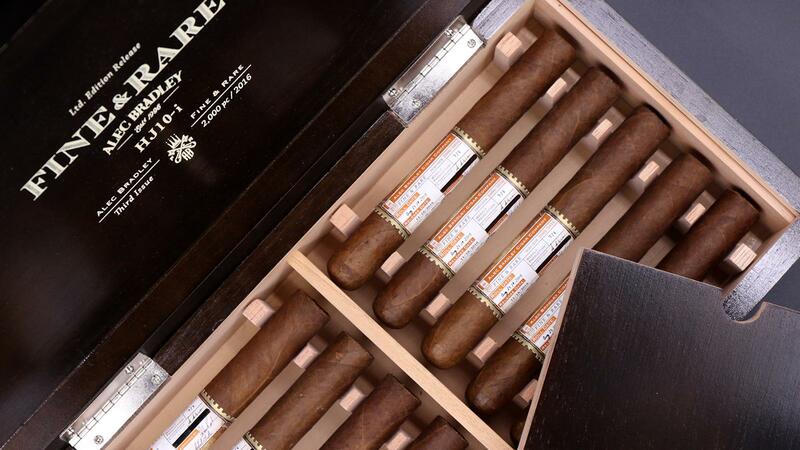 Fine & Rare, a limited-edition cigar containing 10 different tobaccos that the company says were aged from three to six years, officially began shipping today. The 2016 Fine & Rare will come in one size only, a 6 inch by 52 ring gauge parejo. It is said to contain seven different types of filler tobaccos hailing from the Trojes region of Honduras as well as Estelí and Jalapa in Nicaragua. The two binders were cultivated in Estelí and Trojes, and the cigar is covered a corojo wrapper from Trojes that is proprietary to Alec Bradley. "After critical acclaim and popular demand, we felt that 2016 was the year to reintroduce the Alec Bradley Fine & Rare HJ10-I," said company owner Alan Rubin. Like in past years, the 2016 Fine & Rare comes packaged in ornately detailed wooden boxes that contain 10 cigars, with each stick resting in its own slot. Only 2,000 boxes were produced. Additionally, the cigar, which will have a manufacturer's suggested retail price of $16, bears a large band with the name of the rollers, supervisor and principals of the Alec Bradley Cigar Co. on it. Click here to see ratings of past versions of Fine & Rare.